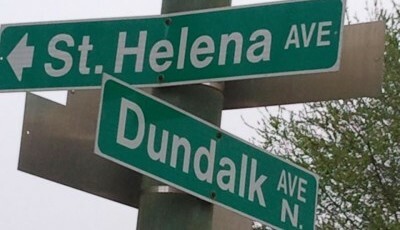 We are located on the corner of St. Helena Ave. and Dundalk Ave. in historic Dundalk. You can click on the street sign image for directions from Google Maps. No matter who you are, there’s something I know you and I have in common: we both want joy. We both want the keen, bracing sensation of complete and utter delight in where we are and what’s happening to us. Everybody wants that – the sailor on the rail passing under the Key Bridge on his way to who-knows-where, the boater letting his craft down the ramp for another lazy afternoon out on the Bay, the woman reading a trashy novel and wondering why it’s so unsatisfying, the retired steelworker wondering about the failure of what used to be the largest steel mill in the world, even the derelict with his face under yesterday’s Sun on a bench at Veterans’ Park. All of them. All of us. People hunger and thirst for real joy, genuine pleasure, and true delight. What folks can’t seem to figure out, though, is where real joy may be found. At Dundalk’s First Baptist Church, we answer the question very simply: true joy is found in living for God’s glory. And what exactly is “God’s glory”? It’s God’s utter goodness and infinite greatness, put on display for all to see. It’s the visible, sensible proof that God is a big deal – the biggest. So then, living for God’s glory is living life to make God look good, and to bask in how good God looks. We simply say that God’s glory is our passion. We have a passion to know more about Him, and to show more about Him. We thirst to sense more of God’s beauty and holiness and symmetry and love and justice. And we yearn to see others enjoy God as we enjoy Him. In other words, Dundalk’s joy is our mission. You see, we know from the Bible that the only place you’ll ever find true joy is where we have found it: in living for God’s glory. You can live for your pension or your bass boat or you grandchildren or your bowling league if you want to – but there’s no true joy there. If it’s delight you want, you’ve got to drink from the fountain of delight: God Himself. We’re on a quest for joy here at the First Baptist Church. Come on, and join us in the hunt! Oh, and yes, we are a conservative Southern Baptist church, in hearty agreement with the Baptist Faith and Message of 2000. First Baptist Church of Dundalk was founded in October of 1930. Within two years after the founding of our church, one in every four American workers was unemployed. Even through these trying times and many more to come, God has helped us through. We still believe in this church because we still believe in God. Although all of us have found ourselves faithless from time to time, God has proved himself faithful. He keeps his promises, and he keeps his people. As of this year, 2018, he has kept us for eighty-eight years! And he’s not just kept us around, he’s kept us worshiping him, and growing new worshippers, as well.